It’s 4:30am and I am about to wake our two sleeping and still very tired children. 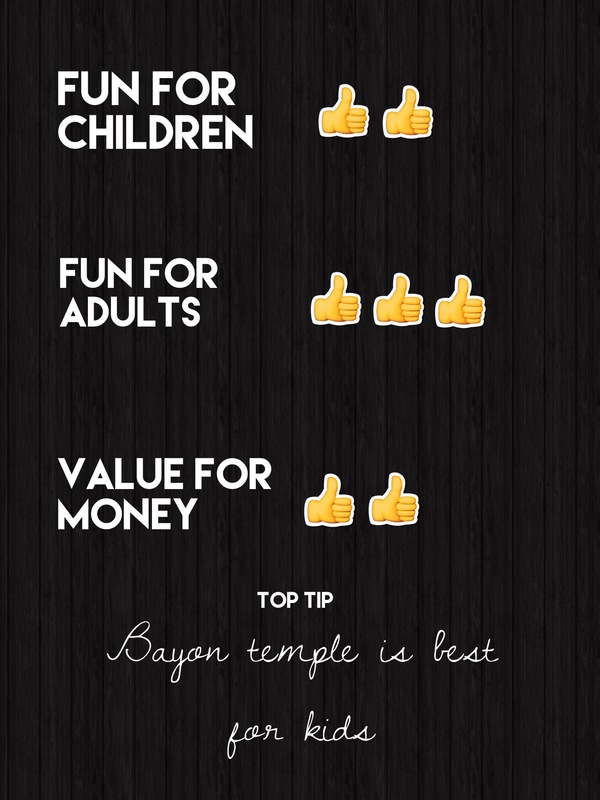 A temple tour with a 3 year old and a 5 year old in tow has me quite apprehensive. I’ve told them it’s a jungle adventure. I nudge my eldest very gently and whisper “come on, it’s time to wake up.” His response is instant. “I don’t want to go on an adventure!” he shouts, pulling the covers over his head and holding them tightly so I can’t bother him further. He started pretty much as he intended to go on. We chose a local company called Angkorwat-tours.com for our tour and booked everything online before we left Guangzhou. No cash payment in advance was needed and the company was incredibly responsive to emails; replying quickly and with all information requested. We booked the one day temple tour by Tuk-Tuk with a private guide. The price for the guide, driver and transport was $75 and also included water at regular intervals. Not included was the national park fee ($20 per adult, the children were free, although this is set to double from next year) and any food we chose to buy at the temples. Prior to leaving, a lot of people warned me that things would be cheaper if I booked once I’d arrived but not being one to leave things to chance I went ahead and booked anyway. Sure enough, our hotel offered an Angkor Wat Tuk-Tuk tour for $15, so substantially cheaper. However, I’m lead to believe this tour was simply a drop-off service for the temples. By the end of our tour I had no qualms about handing over $75 plus tip to angkorwat-tours.com despite this, which speaks volumes for the quality of the tour. At 5am on the dot we headed into the dark and deserted reception of our hotel and found the guide waiting for us. He was accompanied by a driver and a Tuk-Tuk which, although a slight squeeze, managed to accommodate the 5 of us on the 20 minute journey to Angkor Wat. By all accounts, this is the time to go if you want to avoid the crowds and catch sunrise. For even fewer visitors, stick around after 9 when all of the other tourists seeking to avoid the crowds go back to their hotels for breakfast but before the late risers arrive. Before heading into the park, tourists have to buy a pass at the ticket office on the main road to the temple. At 5:15am, there was a steady stream of tourists going into and out of the building but no queues whatsoever. Prices for entry into the national park are $20 for one day, $40 for three days and $60 for seven days. Each pass has the holders photograph printed onto it and these are not transferable. They are also checked EVERYWHERE and so the possibility of sneaking in is nil unless you fancy some pretty heavy jungle trekking. 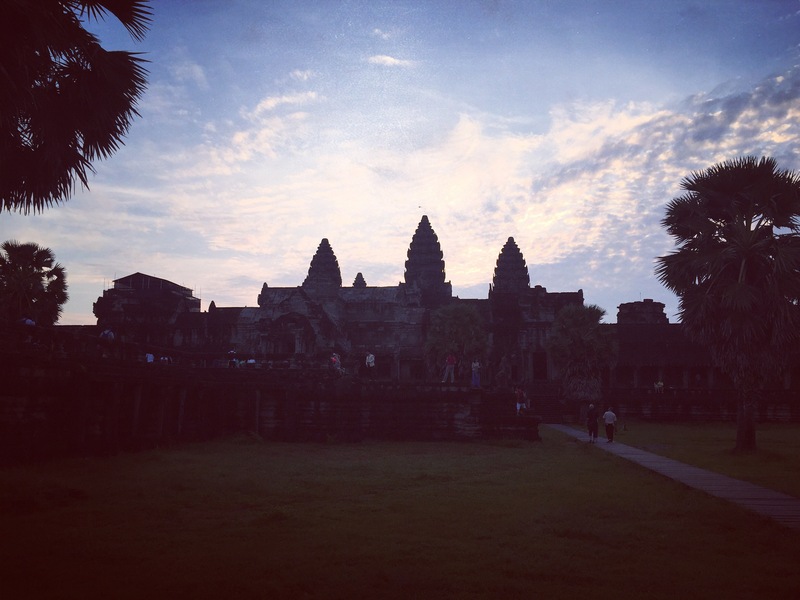 Another top tip from our tour guide was to arrive at Angkor Wat via the East Gate which is not used by as many tour groups as the more famous West Gate. The East Gate takes you in through the back door. You cross the moat on a causeway installed by the French in more recent times and are met with the less well known sight of the back of the temple. Whilst this most certainly was less busy and allowed us to forgo the long walk to the temple from the West Gate, I felt it robbed us of the ‘reveal’ that you experience in places like Petra. 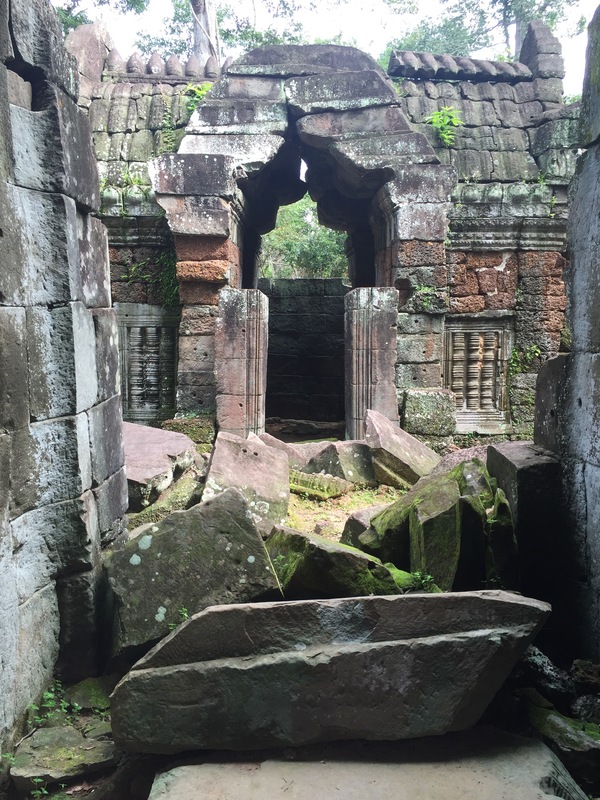 It was a functional introduction to Angkor Watt with very little in the way of splendour. The West Gate reveals the temple slowly as you cross the moat and head towards the libraries and inner wall. You approach with the typical view of the 5 towers and temple as you get closer. Entering from the East Gate, I felt a certain amount of “oh, so this is the temple, fair enough”. It was like entering Disneyland through the staff entrance. With that said, the rest of the day was a genuinely magical experience, with each new temple more intriguing than the last. From Angkor Wat our guide took us to the south gate of Angkor Thom where scowling demons and smiling Buddhas glare at eachother from either side of the road bridge and scarlet clad elephants carry tourists through the gate and up to the temple. From there we drove to Bayon Temple and past the terrace of the elephants where war elephants were trained to fight almost one thousand years ago. After this we took a quiet track through the jungle and parked in a secluded clearing at a temple where we were the only visitors. 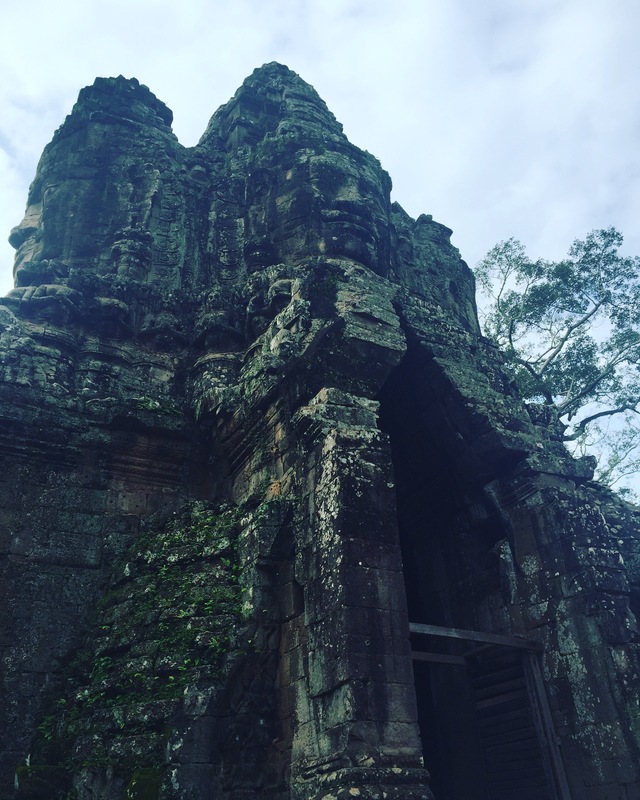 The highlight of the trip, the temple was like Ta Prohm but with less restoration. We were left to clamber over walls and towers which had been left where they had fallen and without the bustle of large crowds of other tourists. Our guide rounded out the trip with a stop at Ta Prohm, the temple made famous in recent years by its appearance in the Tomb Raider movie. This is the archetypal temple. 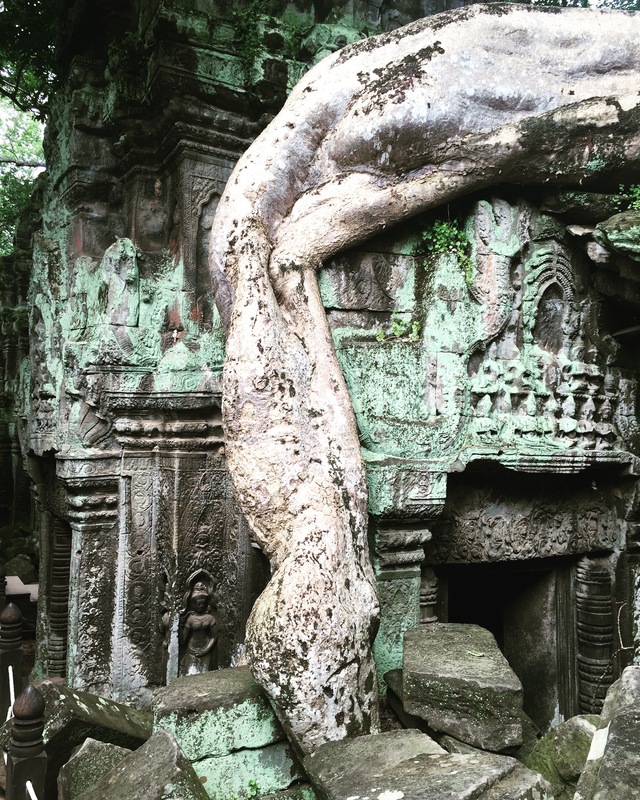 If you were to paint a picture of a temple using only your imagination, Ta Prohm is what you would paint. 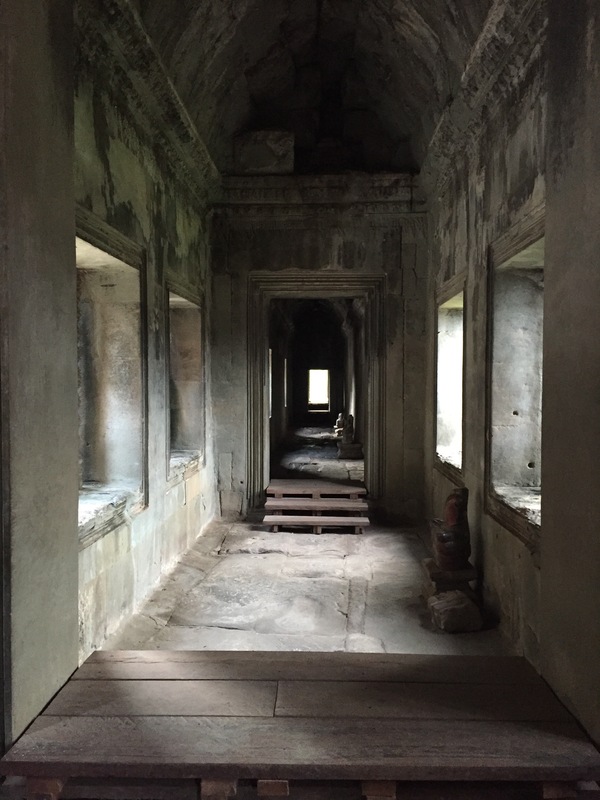 Crumbling walls, large teak trees whose roots burst through the rubble and drape themselves down the walls and dark entrances to hidden rooms. The whole thing is straight out of a storybook and provided the perfect final stop. Special mention has to be given to our tour guide. He was knowledgeable, interesting and genuinely cared about both the tour and Cambodia in general. We spent a lot of time talking about his life and his family during the civil war and subsequent war with Vietnam as well as the more ancient history of the temples. These personal touches alone made the tour worth the $75. 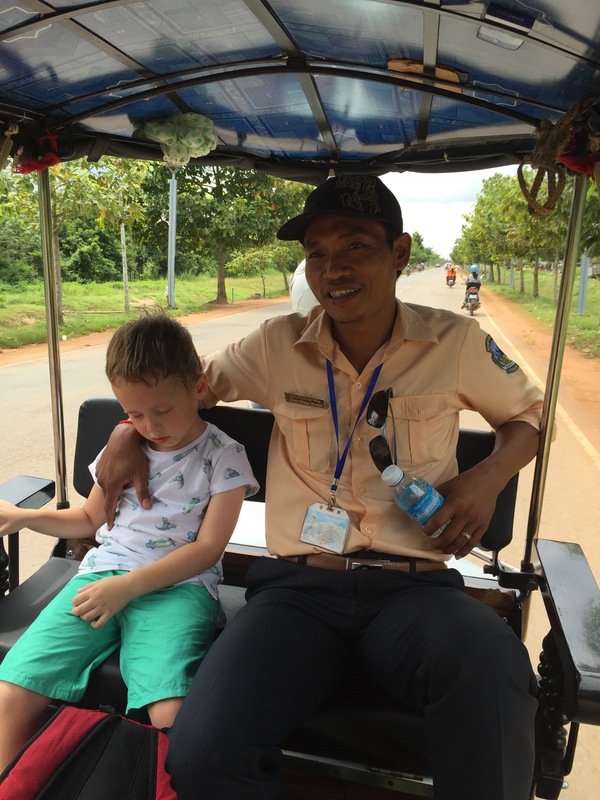 He was also very good with the children and our eldest fell asleep on him in the Tuk-Tuk on the way home. As for travelling with children; we did eventually have to admit defeat. Despite my utopian view of educating my small family about the importance of the past and them realising just how lucky they were to be visiting a UNESCO world heritage site, the distances walked and scope of the tour soon took their toll. From about the 90 minute mark we were struggling to hear the guide over pleas of ‘can we go home now, I want to go in the swimming pool’. 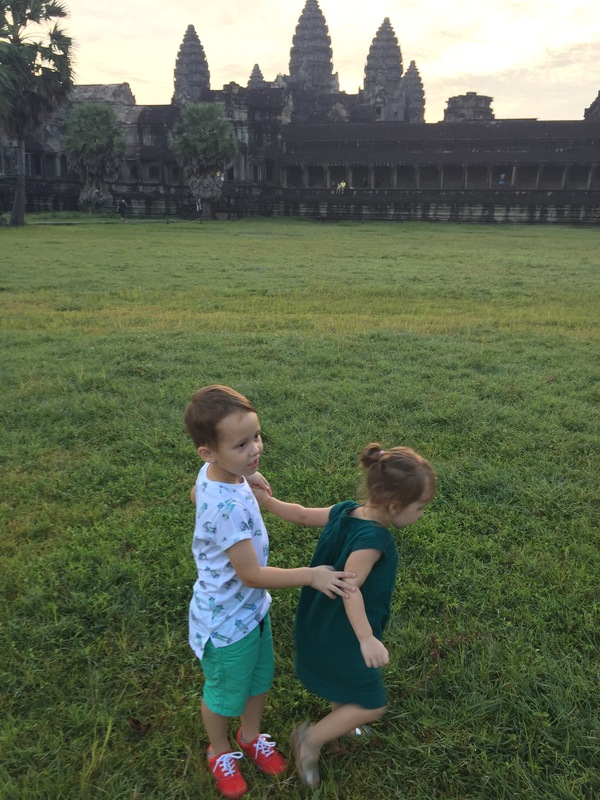 The temples themselves, whilst entertaining for the first 30 minutes, were also difficult to navigate for little feet and the upper level of Angkor Wat was actually out of bounds to children under 12. Bayon temple also provided us with some scrapped knees and my wife and daughter stayed outside of our ‘off the beaten’ track individual temple visit, whilst our 5 year old son took a few more tumbles on moss covered rocks. So was it as magical as we expected? Absolutely. Would we do it again? I think we would, but we’d learn from our mistakes. It’s definitely a place to visit with older children or, if visiting with younger children, then fewer temples are definitely in order. Will our children talk about it for years to come? I’m pretty sure they forgot about everything they’d seen the minute the hotel pool came back into view. But we’ve made some memories that I hope will at least surface from time to time in the coming years and for me, that’s enough.